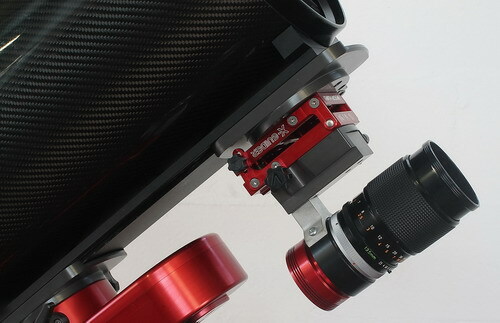 The X-Guider is a Tangent Mount Assembly of the telescope. Is extremely compact and innovative for found the guide star in astrophotography, which comes from a long experience in the field of astronomical photography. Its main characteristic is that while having a load capacity of more than 6 kg is very light, with a mechanical simple, robust, without slack and above all it has the ability to make adjustments with one hand through two convenient knobs, look much important when one must act in uncomfortable condition. Once the final position is found possible to lock the elevation through two knobs and since the azimuth is ensured by the pressure of a spring very strong, the system is totally free from play and mechanical deflection, absolutely essential factor in a system of autoguider. Another important aspect is the low profile that allows you to maintain a low center of gravity resulting in less weight to balance. The system is equipped with a dovetail standard GP for fixing the guide telescope and a second removable flange GP, through which it is possible a fast and efficient mounting in parallel on a standard bar GP is the side that superimposed on the main telescope. 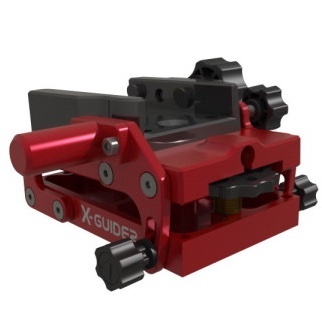 The Avalon X-Guider is a high precision and play-free guidescope aligning device. 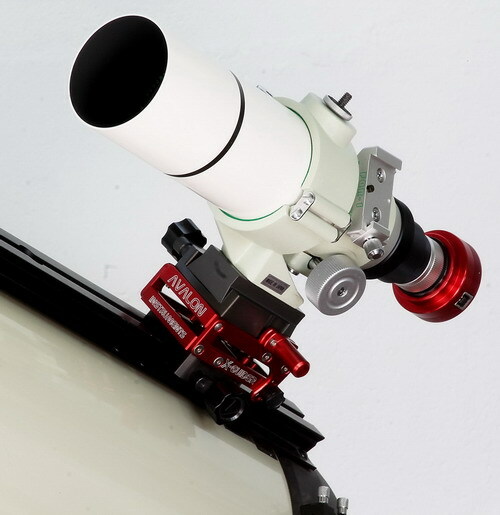 Unlike conventional guidescope rings, which rely on pushing screws on to the body of the tube, the Avalon X-Guider features a dovetail mounting system (GP 45mm size) for a quick-release attachment/detachment of the guide scope on the main telescope. The X-Guider features a very compact body, an innovative design and a beautiful look. All metal aluminum parts are CNC machined. All screw knobs, designed by Avalon Instruments, have a special ergonomic design and are made with a special polymer. It features also a very hard anti-scratch anodized surface finish with CNC engraved characters. 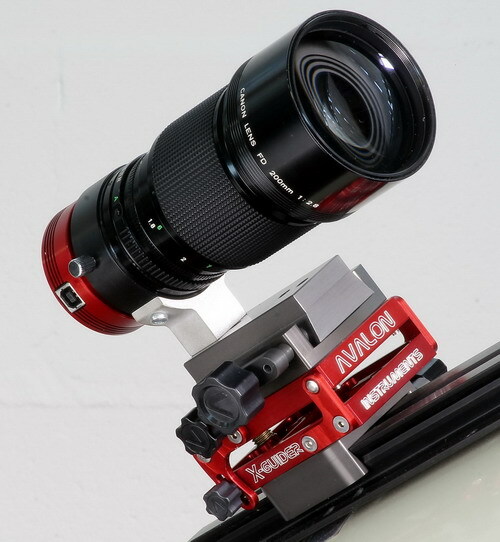 The Avalon X-Guider is used to easily locate guide stars during astroimaging sessions and it has been designed after much experience in deepsky astroimaging. 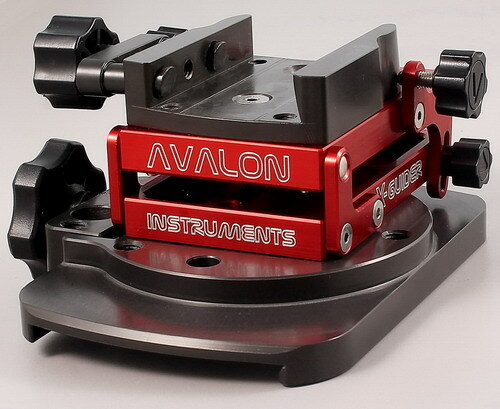 One of the most innovational aspects of the Avalon X-Guider is the ratio between the high loading capacity up to 5 Kg (12 Lbs), and the device weight, of less than 500 g. This is a very useful characteristic for portability as well as putting significantly less load on your mount. The X-Guider mechanics are very simple, sturdy, totally free from backlash in azimuth and free from flexure in typical working situations.